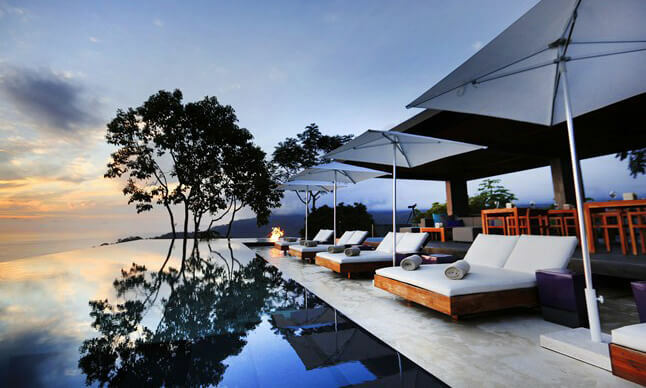 Costa Rica with its exceptional selection of fine hotels means that many of these properties have some exciting and sometimes very different swimming pools! After all many Costa Rica swimming pools make up the perfect place to relax under the tropical sun, and what better way to sooth your muscles after an exciting day of adventure than to slip into a warm thermal swimming pool that’s naturally heated by an active volcano or a pool with a sublime ocean view that is second to none. In this selection of pics we have shown some of the finer pools that are to be enjoyed throughout Costa Rica. Maybe you have had the pleasure of enjoying a few yourselves, if so let us know which one is your favorite or perhaps we have missed an essential swimming pool, if so let us know! The pool at Kura Design Villas offers perhaps the best view of them all high above the south Pacific. It looks like a sheer drop from the edge of the infinity pool all the way down to the coast. Check out cool features like the underwater sound system and the fire pit! Hotel Punta Islita‘s infinity edge pools offers spectacular views of the Pacific ocean. This eco-friendly slice of paradise can be found on the Nicoya Peninsula. It’s not an easy-to-reach destination, but worth the trip as you look down on their private cove. At Tulemar Resort’s main pool it’s almost guaranteed that you’ll be joined by the local monkeys! These homey private villas are great for families and ideal for those that love being surrounded by nature. Down at the private beach, the hotel provides kayaks and boogie boards for your use. Copa del Arbol‘s modern pool offers a refreshing escape from the hot humidity of the Osa Peninsula. This is a real jungle escape (albeit with A/C) reachable only by boat where in the end you can enjoy yoga, hiking, massage treatments and water sports! The Flamingo Beach Resort pool offers one of the best sunsets in Costa Rica – right over the pool! With tons of onsite amenities, a meal plan option and only a few steps to the sand you really don’t need to go far for a great beach vacation. The Florblanca Hotel offers this lovely romantic pool that is ideal for Honeymooners, especially at night. Santa Teresa is a hotspot for creative, international dining and this onsite restaurant is no exception. Wellness and sustainability are focus here with yoga, a spa and lots of activities provided onsite. The Four Seasons Resort offers enticing plunge pools at each of its private villas that overlook the Papagayo Peninsula and the Pacific. Excellent dining options (with a view) and countless tours on offer are just some of the amenities you can endulge in here. Hotel El Establo is one of few hotels in Costa Rica that have an indoor heated pool—a nice treat when you’re high up in the cool cloud forest. It’s a great way to relax after a long day of enjoying the many onsite adventure activites like ziplining and hiking. The JW Marriott pool—one of the largest pools in Central America—is lit up luxuriously at night and perfect for families and adults alike. The hotel offers tons of amenities, various dining options and has trails to three surrounding beaches, one of which is only steps away. The simplicity of the pool at Lapa Rios is the perfect spot to watch the vast array of local wildlife. They call it eco-luxury for providing first-class service while staying true to the integrity of the remote location. There is lots to explore: beaches, waterfalls, and many trails great for wildlife spotting and birdwatching. The pool at the Los Sueños Beach Club offers great views & a fine swim-up bar to enjoy a cocktail. Probably the easiest coastal area to reach from San Jose, here you can find excellent amenities and an active Marina, home to the best sportfishing charters in the country. Perfect fun for the kids at the Aninga Lodge pool shaped just like a turtle! It’s very appropriate considering this meal-inclusive hotel is on the Caribbean coast in Tortuguero where sea turtle nesting is the town’s claim to fame, along with the canals that are home to a great array of species. The adult-only pool at the El Parador Resort offers great views over the central Pacific coast. With a wide array of room choices this hotel is excellent for families while also catering to a more mature crowd in the adult-only section. The calm of the evening is reflected in the pools at the Club House at Reserva Conchal. Enjoy the world-class 18-hole golf course in this secure and comfortable gated community ideally located along one of the most beautiful beaches in Costa Rica, Playa Conchal. The Turkish Baths are exquisite at the Spa of Reserva Conchal, certainly worth relaxing here. These high end amenaties are what vacations are all about! Enjoy a modern take on the thermal hot springs in the swimming pools of the Royal Corin hotel. Behind the pools near the spa you can even hear the thermally heated water bubbling under ground—that’s something you don’t hear everyday! The Tabacon Grand Spa Thermal Resort is a luxury oasis thanks to the extensive hot springs on the property. Adults looking for more privacy can make their way to the Shangri-La Gardens where they can enjoy 6 adult-only thermal pools as well as a nice place to lounge and order snacks and drinks. The Springs Resort offers a fine mix of soothing thermal and refreshingly cool pools located around the resort. In addition enjoy extensive menus and lots of entertainment options including a game lounge, a casino and the one-of-a-kind Club Rio. From the two-tired, infinity edge pool of Hotel Villa Buena Onda can you enjoy a great view of the north Pacific ocean and the town of Playas del Coco. There is nothing better than enjoying a cocktail at the swim up bar as the sky turns from blue to pink while the sun goes down. One of the largest pools in Central America is found at the beachfront Westin Playa Conchal. This all-inclusive resort with nightly entertainment and tons of onsite amenities really is perfect for everyone!